(Nanowerk News) As electricity travels from power plants and into homes, a large amount of the initial energy dissipates as heat along the way. This inefficiency comes from a resistance to current inherent to the metallic cables used to deliver the electricity. High-temperature superconductors, however, manage to transmit energy without loss, providing a potential conduit for efficient and inexpensive power distribution all over the globe. Unfortunately, the mechanism underlying these remarkable materials remains unknown, hampering the development of more advanced materials to provide that loss-free flow of electricity. Now, physicists working at the Department of Energy’s (DOE) Brookhaven National Laboratory and Switzerland’s Paul Scherrer Institute have revealed key quantum characteristics of high-temperature superconductors, demonstrating new experimental methods and breaking fundamental ground on these mysterious materials. 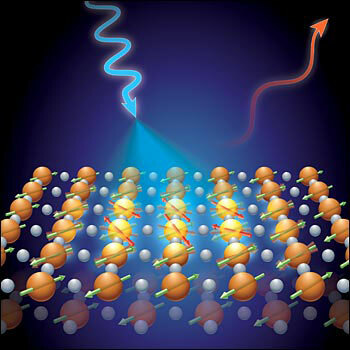 Using a technique called resonant inelastic x-ray scattering (RIXS), scientists examined the magnetic spins of atomically thin layers of copper oxide materials. In a surprising discovery published in the journal Nature Materials on Sept. 2 ("Spin excitations in a single La2CuO4 layer"), researchers found that the spin waves present in complete, three-dimensional samples survived all the way down to the atomic level. In this breakthrough technique, intense x-rays deposit energy into the magnetic spin waves of atomically thin layers of high-temperature superconductors. The difference in x-ray energy before and after interaction reveals key information about the fundamental behavior of these exciting and mysterious materials. Traditional superconductors, discovered more than a century ago, have been well explained by theory for decades. But despite that fundamental understanding, these remarkable materials still face a significant obstacle to effective implementation: the lossless behavior only occurs at temperatures close to absolute zero, almost as cold as the vacuum of outer space. The considerable power consumed cooling down superconducting cables offsets the benefit of their perfect current conveyance. High-temperature superconductors, meanwhile, are perhaps mislabeled, as even these poorly understood materials must be cooled down to the inconvenient temperature of liquid nitrogen, some 350 degrees Fahrenheit below zero. But unlike traditional superconductors, the underlying physics behind their properties remains unknown, giving hope that they might be manipulated and adapted for broad use. Magnetism is the direct result of electron spin, which can be imagined as a distinct directional arrow attached to each particle. In magnetic materials, when all of these individual arrows point in the same direction they produce the cumulative effect of a magnetic field – e.g, the north/south orientation of magnets. Down on the nanometer scale, electron spins rapidly communicate with each other. When a spin flips inside a magnet, this disturbance can propagate through the material as a wave, tipping the neighboring spins in its path. Some researchers believe that this coherent spin wave, called a magnon, may be what binds electrons together to create high-temperature superconductivity. The magnetic wave conversations are particularly strong in these materials, suggesting their role in that crucial conductivity. Brookhaven Lab’s Ivan Bozovic specializes in designing and fabricating nanoscale superconducting materials using a custom-built molecular-beam epitaxy (MBE) machine. Bozovic is uniquely equipped to monitor the synthesis of the superconductors in real-time, giving him an unparalleled degree of control and quality. Bozovic grew samples that consisted of two-dimensional layers of lanthanum copper oxide (La2CuO4) stacked and separated by insulators to prevent interference between layers. The x-ray experiments only reacted with the copper atoms in the sample, making the insulator scaffolding effectively invisible and isolating the superconductor layers to precisely probe for spin wave behavior. Dean and Hill worked alongside collaborators led by Thorsten Schmitt at the Paul Scherrer Institute, which hosts one of the world’s most sensitive instruments for resonant inelastic x-ray scattering. Using this machine, called the Super Advanced X-ray Emission Spectrograph (SAXES), the researchers examined subtle quantum spin excitations at lower energy levels than ever before. The full story behind high-temperature superconductivity remains uncertain, but this technique revealed that these quantum spins behave very similarly to classical magnets. The researchers also found that certain predicted quantum effects were not present in the two dimensional samples.